A literature unit created for Mrs. Paulsen's sixth grade students. Over the course of the next month, we will be reading the book, The Man Who Loved Clowns. This book is a great lesson on tolerance. Using this book we will complete many activities and assignments. You will use this online unit to complete the assignments by accessing the links provided. The first link you should access is the calendar. This will tell you all of the due dates for the entire unit. During this project you will complete daily assigned reading pages along with comprehension questions. Here is a list of activities and assignments you will be expected to complete in addition to the daily questions and reading. Weekly Journal-You will complete a one page journal entry every Friday. This journal should reflect one what you have read and learned during the week. You will also be expected to make predictions for the following week's reading. Worksheet #1-You will complete a worksheet of facts about Down's Syndrome using the book as a guide and the Internet to help you find additional information. Quizzes-The quizzes over this book will be listed in the calendar. I-Search Paper-An I-Search paper is a fictitious story. It uses true facts to enhance the characters. Like a research paper, you will research a given topic. In this case you will research a dibilitating disease or illness to use in the story. As the story progresses, you will give information about topic. 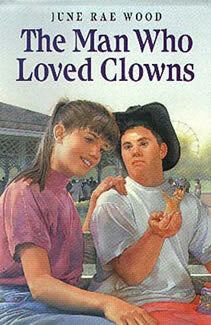 The audience will learn about the topic much like we learned about Down's Syndrome by reading The Man Who Loved Clowns. This paper must be 8-10 pages typed. The calendar provides you with a detailed list of when we will be working on these and due dates. The final paper is not due until December 19. Interview-As part of your research process you must find one person who is knowledgable about the disease you chose to research. You will compile a list of questions and complete this interview. The questions and the results of the interview will each be seperate grades. Worksheet #2-This worksheet you will be using to gather information about your topic for your I-Search paper. TrackStar-This is a hotlist of sites for you to view. With each site, there is a one paragraph assignment with questions to be answered. Take your time on this. It will help you to understand how people's lives are affected by Down's Syndrome. 8.1.2-By the end of eighth grade, studenst idetify, locate, and use multiple resources to access information on an assigned or self-selected topic. 8.2.1-By the end of eighth grade, students will write using compositions with focus, related ideas, and supporting details. 8.2.2-By the end of eighth grade, students will revise and edit descriptive compositions. 8.2.5-By the end of eighth grade, students will demonstrate the abiltiy to use self-generated questions, note taking summarizing and outlining while learning. 8.3.1-By the end of eighth grade, students will participate in group discussions by asking questions and contributing information and ideas. 8.7.1-By the end of eighth grade, students will develop an understanding of personal health. June Rae Wood's Web Page-This page gives information about the author. Unit Rubric-This is the grading scale that will be used at the end of the Unit. This page was created by JoDee Paulsen using Web Poster Wizard.